Our February meeting program will feature Al Nelson. Al provides a very entertaining and informative demonstration. With the assistance of the helpers he brings, there will, no doubt, be many things going on at the same time. Al is a native Californian, born in Berkley. He started his working life as a woodworker, and then moved on to a long career in sales. 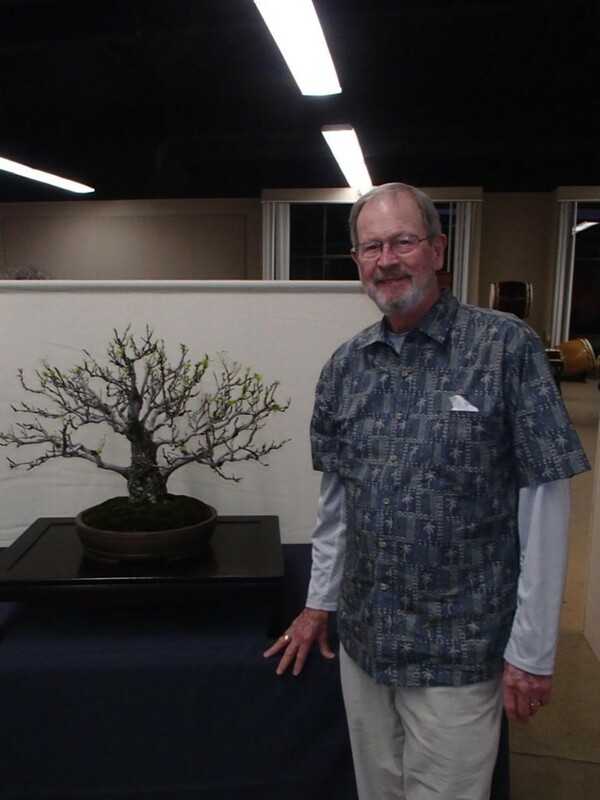 Al attended a demonstration by the late John Naka in the late 1970’s and was inspired to take up the bonsai art. He studied with Harry Hirao, John Naka, and Ernie Kuo. Come watch Al at the February meeting, be entertained, and learn. We had a great crowd for our annual Pot Luck dinner in January. As usual, there was plenty of good food for all and an abundance of desserts! It was nice to see everyone and talk about the new year. The raffle table was full, so many of us went home with something new. Now is the time to renew your membership for the year; $20 for an individual, $25 per family. See Judy and Steve at the next meeting. 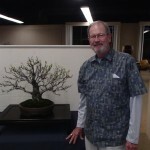 We want to see all the familiar faces and new ones join us in our enjoyment of the bonsai art form. We’ll be having monthly programs to sharpen our skills and raffles to tease you with bonsai items you can’t live without. It takes everyone’s participation to keep the club moving forward, and I welcome anyone willing to volunteer. If you haven’t seen our website recently, take the time to look and see how beautiful and informative it is. Our member, Robert Sencer, did a great job creating the site, and he continues his great work with regular updates. The week after our pot luck, Baikoen had their annual Winter Silhouettes show. 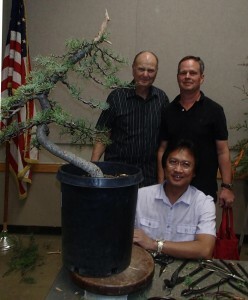 As part of the show, Our club along with California Bonsai Society and Kofu Kai participated in a round robin demonstration, each with a different tree. 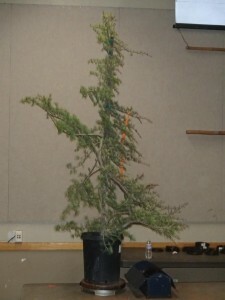 Our team, consisting of Jim Barrett, Ray Blasingame and Peter Macasieb worked on a deodora cedar tree. The tree had a lot of lower movement, and the team took advantage of it by cutting off the tall top. They wired and positioned the branches into a pleasing informal upright tree. All three trees were auctioned off after the raffle. You have probably noticed postage costs have gone up again. I encourage all of you who have a good working relationship with your computer to request your newsletter be sent to your email. You can also see the newsletter on the website. The club will continue to mail the newsletter to those who prefer the regular mail. 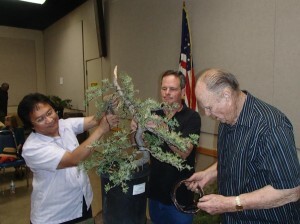 The Bonsai-A-Thon will be presented Saturday and Sunday, February 22 and 23 at the Huntington Botanical Center. A separate email down-loadable link containing detailed information as well as the official “Bonsai-A-Thon Participant” badge will be sent out to those receiving the email newsletter. The badge will be your free admission ticket to the event. Dave will have some printed copies at the February meeting for those who don’t get the email link.